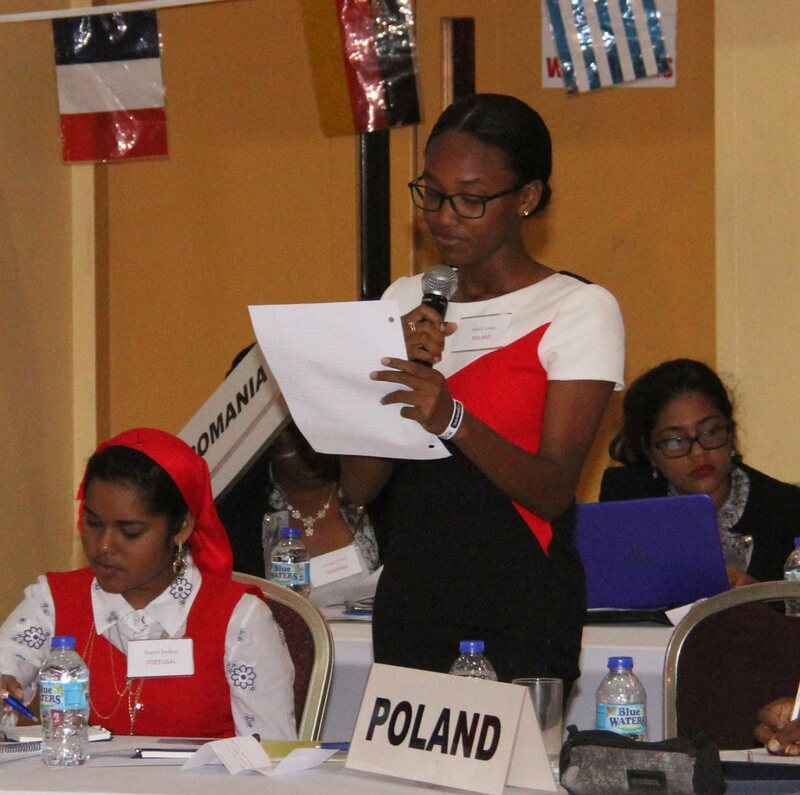 Trinidad and Tobago came under fire at the Rotary Club of Central Port of Spain Model UN (MUN) 2019 Resolution on International Migration and Development yesterday morning. On the first day of the general assembly, youths representing various countries questioned the TT delegates on why the country had not “little to nothing” to assist refugees and migrants from Venezuela. The MUN at the Cascadia Hotel and Conference Centre, St Ann’s, simulated a real United Nations General Assembly with students representing governments of various UN member states. This 21st annual MUN give over 100 local and regional youths from TT, St Kitts, St Lucia, Guyana, Curacao, as well as four refugee youths from the School of Hope, a voice in exploring solutions to this global challenge. The secretary general noted that war, civil unrest, persecution, human rights violations, underdevelopment, climate change and natural disasters were leading to large movements of refugees and migrants every year. She said over 60 million fled violence and persecution while 225 million migrants went to other countries to search for better opportunities for survival. Germany questioned how TT could claimed financial restraint while NGOs were rallying to get Venezuelan children educated. While suggesting that TT should not accept more immigrants than it could accommodate, Libya asked what measures TT was taking to control the number of migrants entering the country. TT was also asked about human trafficking and why it was not accepting Venezuelans in public schools. Stating that resources were limited and noting the recent closure of Petrotrin and the resulting loss of numerous jobs, the TT delegates responded by asking how the country was expected to support others when it could not support its own people. The delegates also acknowledged that Venezuelan refugees received care from NGOs including UNHCR which recently distributed care packages. It was a very lively debate on topics including the Syrian civil war, the situation in Venezuela, the Nigerian refugee crisis, and refugee camps. Some believed it was better to focus on resolving the problems from which the refugees fled rather than hosting them. Poland was subject to criticism because their refusal to let refugees into their country although its delegates stressed it assisted refugees financially and medically. US President Donald Trump’s stand on immigration was also raised several times – the Mexican boarder wall, the ban on foreign nationals from seven predominantly Muslim countries, the separation of migrant children from their parents, etc – as it went against several declarations and agreements. Delegates highlighted the number of refugees or migrants they welcomed into their countries, defended their stands to refuse to open their boarders, noted the facilities and services provided to refugees, or pointed out that, while they could or would not physically facilitate refugees or immigrants, they assisted financially. Other country delegates were put on the defence as they were asked how they could claim to help refugees and migrants when they countries were politically, socially, or financially stable. Others were accused of exploiting displaced individuals or not integrating them into society. South Korea was even accused of imprisoning their refugees on Jeju island. At one point the Philippines delegates asked how China could not support migrants in their country when Chinese immigrants populated countries all over the world. The China delegates said the country already had one of the largest populations in the world so it contributed financially although it could not take in more people. Reply to "TT ‘under fire’ at UN"